Virtual Contact CenterA contact center that enables agents to be located in different geographical locations yet managed as if they were located in the same physical location. directs chat requests to agents via a chat queue. AgentAgents use the Agent Console to view and manage customer interactions. Virtual Contact Center supports Regular agents and Supervisor agents.s must be in Available state to receive these incoming requests. When an incoming chat is offered to an agent, the chat tab blinks indicating an incoming request. The agent can accept or reject the chat request. On accepting, the agent's status changes to Busy. On rejecting the request, the agent's status changes to On break. Note: You can view or edit your queue assignments in the Agent Profile. For details, refer to Viewing Queue Assignments. Note: If the customer supplied account or case information when initiating the chat, the Agent ConsoleVirtual Contact Center's browser-based graphical user interface (GUI) used by Agents to manage customer interactions. accesses the appropriate record and presents the record for preview.The screen pop behavior may vary based on the settings. If the request is from a new customer, a new customer record entry form pops. 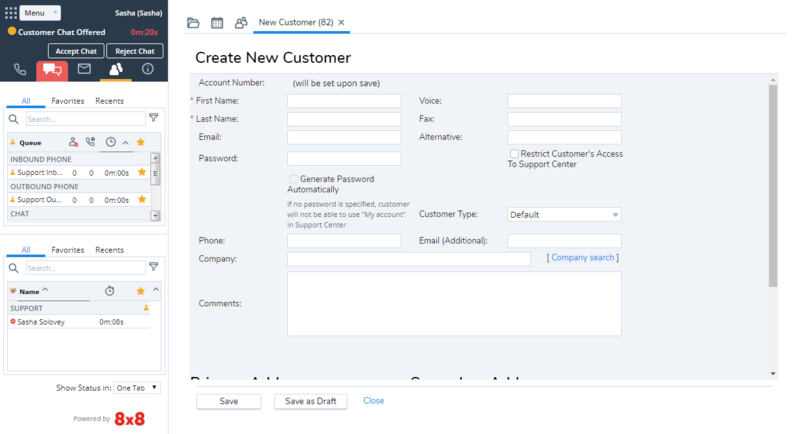 Enter the details of the new customer and save the customer record. If chat log is turned on, a chat log is created and pops in edit mode. Save the log by selecting the newly created customer from the list. The log saves as a case. Preview the record details and click Accept Chat. Note: If you reject the chat or failed to accept it before the acceptance interval lapses, you are placed on break status. Click Send. Your chat entry is posted on the customer's chat window. You are also notified of typing in progress on either end. Optionally, insert information from FAQs. For details, refer to Inserting FAQs in Chat. The chat conversation ends. You are placed in post processing mode to wrap up. Your status changes to Post Processing. You can end post processing or wait until the post processing timeout occurs. At the termination of the chat, a chat log may pop. The chat log opens in view mode or edit mode based on the settings. Auto log occurs if and only if administrator has configured it. 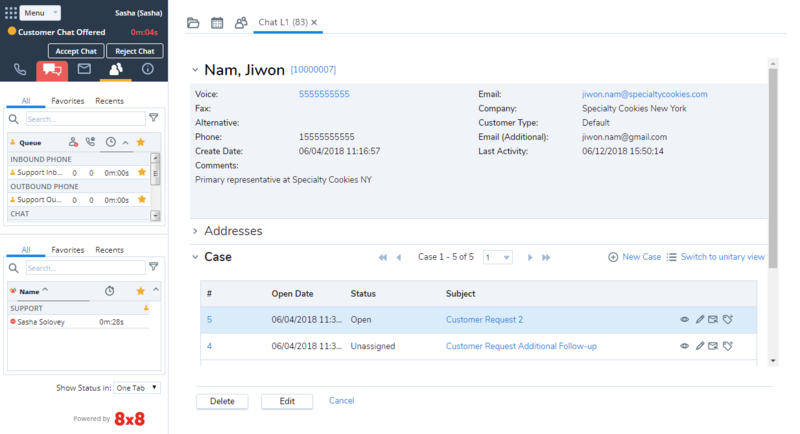 Note: Chat log opens in view mode if the chat request is from an existing customer, associates the log case with that customer record automatically. Note: Chat log opens in edit mode if the chat request is from a new customer. While saving the log, you are prompted to select a customer from the existing list. Edit chat log case as desired and save or save as draft.